BOSTON CREW label. Mid weight Jacket. This Jacket has a. From the Cut of the Cotton outside. "Golfing Style". Finished in a Light Stone/Beige. one of which is button fastened. Button Fastened. Beautifully lined, 100% cotton. Shoulder to cuff 26”. Length 33”. 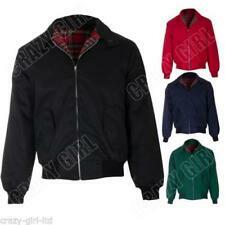 BOSTON TRADERS LUMBERJACK SHIRT JACKET. 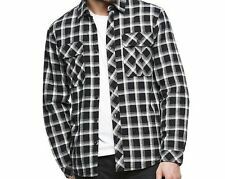 Polar fleece lined flannel shirt. Auctiva's FREE Counter. Black with white. Hooded full zip w/ flannel shirt snap up. Style Shirt Hoodie. Blue, white, gray plaid. Fleece lined hood. Closure Zipper. 2 snap pockets. Closure Snap. Color Blue, white, gray. OUTER MATERIAL: WATER RESISTANT WAX COTTON WITH COURDROY COLLAR. FULL LENGTH ZIPPER WITH STORM FLAP. LENGTH APPROX 32". 1 X LARGE INSIDE POCKET. CHEST SIZE APPROX 44". LINING: 100% COTTON WITH POLYESTER PADDING.